The Fitness Laboratory is a state-of-the-art lab designed to assess the physiological effects of exercise on the human body. The Fitness Laboratory provides scientific support to those striving to achieve improved performance, health and wellness. The lab provides testing, other assessments and a consultation with a certified exercise physiologist who will interpret test data, provide tips on how to apply your results and make your exercise/training program as successful as possible. What is my “fat burning” range? How many calories do I burn during exercise? What is my ideal target heart rate? What is my cholesterol level? Where do I stand compared to others my age? In addition, the lab allows us to track a client’s progress and offer them a “report card” regarding their exercise program. Complete the Medical History Form. Be sure to choose the desired test then click submit. Your form will be automatically emailed to our staff. Your medical history form will be screened by our staff. Based on health history, some individuals may be required to get a signed physician's approval form. You will be contacted if physician's approval is required. You will be contacted to schedule your test. Once scheduled you must pay for your test online or over the phone. Visit wellness.miami.edu to pay online or call the sales office at (305) 284-5433. 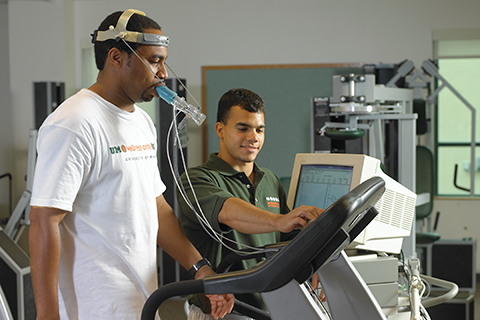 Prior to your fitness lab appointment, be sure to thoroughly review and follow the test prep instructions for your test. Cancellations must be made at least 24 business hours in advance. Failure to cancel will result in a $10.00 administrative fee.